Most people don’t want to sue. But when you’re hit by a tragic loss, catastrophic injuries or a violation of your civil rights, you’re faced with a new and uncertain future, one which may include physical pain, emotional turmoil, medical expenses, and lost ability to earn a living or enjoy life the same way again. You may also want to take action to try to prevent others from being harmed like you were. Our country’s civil justice system was created for just those times. But the legal system can be overwhelming, especially when you’re dealing with the new reality of injuries or losses from an accident or traumatic event. Insurance companies, corporations and government bodies put up barriers which need to be knocked down and hoops which need to be jumped through before you can get fair compensation for the losses caused by someone else’s improper conduct. When a person is rendered weak and vulnerable due to an injury or a catastrophic life event, this obstacle course is tough to navigate. That’s when you need a skilled trial attorney on your side. The Law Offices of Richard M. Wiener, with its team of caring professionals, will guide you through the system and fight for your rights when things go wrong. I was very pleased with the level of concern I received from yourself and your staff. I always received answers to my questions with great compassion and honesty. I always felt that everyone there really cared about myself and my injuries. Whenever I felt anxious or frustrated you always made me feel better. Your staff is very well educated in the needs of the victim of a motor vehicle accident. They are courteous and always available to answer any and all of my concerns. I was always given a time or date when my questions would be answered if they were not answered at the moment I asked. And that was always fulfilled. I would recommend your office to anyone in need of representation. Richard and staff took care of all of my concerns, and communicated with me throughout the entire process. I’m very satisfied with the quality of work and would recommend the Law Offices of Richard M. Wiener. 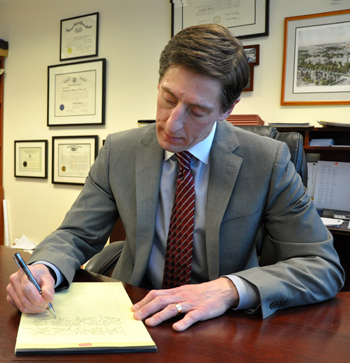 For over 25 years, Richard Wiener has been fighting the good fight for his clients, challenging corporations, insurance companies, police departments and other powerful entities throughout Pennsylvania and New Jersey. He has dedicated his career to helping victims of motor vehicle accidents, slip-and-falls, medical malpractice, defective products and civil rights violations, making sure they get their best shot at full compensation for their injuries and losses.